Deepen your sense of the past at sights like Palace of Versailles and Cathédrale Notre-Dame de Paris. Get a sense of the local culture at Le Marais and Arc de Triomphe. 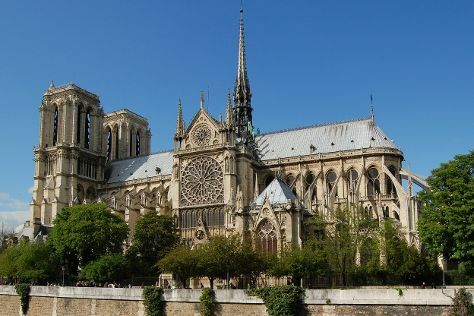 Explore the numerous day-trip ideas around Paris: Chartres Cathedral (in Chartres), Giverny (Eglise Sainte-Radegonde de Giverny & Fondation Claude Monet) and Versailles (Le Grand Trianon, Temple de l'Amour, & more). And it doesn't end there: admire the masterpieces at Louvre Museum, wander the streets of Saint Germain des Pres Quarter, see the interesting displays at Musée Rodin, and appreciate the extensive heritage of Montmartre. To plan Paris vacation without wasting time, ask Inspirock to design an itinerary. If you are flying in from United States, the closest major airports are Paris-Orly Airport, Charles de Gaulle International Airport and Paris Beauvais Tillé Airport. In May, plan for daily highs up to 66°F, and evening lows to 49°F. Finish up your sightseeing early on the 28th (Mon) so you can travel back home.